In the fall of 1993, the Fox television network premiered several new shows. The network, which debuted in the mid-1980s, was still relatively young and only had a handful of popular shows on the air. One show, set for Friday nights, was one Fox executives believed had a shot at being a ratings winner. That show was The Adventures of Briscoe County, Jr. The other show Fox premiered on Fridays that fall was a little show called The X-Files. Legend has it that Fox had little faith in the show. It was hard science fiction that promised aliens and monsters, but through the filter of a police procedural. No one thought it would become the ratings winner it eventually became. But it found an audience, one that grew until Fox had no choice but to move it from the dead zone of Friday night to the more competitive Sunday night, where it joined The Simpsons as a two-headed ratings juggernaut. That was a sentiment shared by X-Files fans (or X-philes) all over the world. 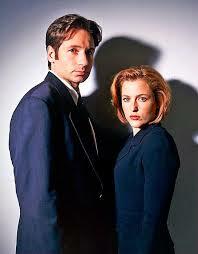 The show ran for 9 years, 202 episodes, and managed to produce two features films: The X-Files (1998) and The X-Files: I Want to Believe (2008). Even after leaving TV in 2002, the show has remained popular in reruns as well as on home video and streaming services like Netflix. This popularity has inspired Fox to bring the show back. A six-episode limited series event starts on January 24, 2016. Fans are excited. When these two show up, you know you're in for a good time. Our intrepid investigators saw all manner of the weird and wacky. In 2016, a new limited X-Files series comes back to TV, 22 years after the show first premiered. © 2015 Patrick Lavery. For educational purposes only. Please click here to email.